Everything is better when used in moderation, and liquor is no acception. Though, even if you feel as though you’re not drunk, you still may well be over the legal limit to drive. Rather than a DUI, you can receive a DWAI in Colorado (driving while ability impaired) if you have more than a .05 BAC. So rather than taking a risk, it would behoove any person who drinks to understand how many drinks puts you, your friends, or loved ones into the DWAI or DUI categories. If you or someone you know has been charged with either A DUI or DWAI and live in Colorado, it is highly advised that you seek out an experienced Boulder DUI Attorney. The size of a person, which really just pertains to their body weight plays a role. 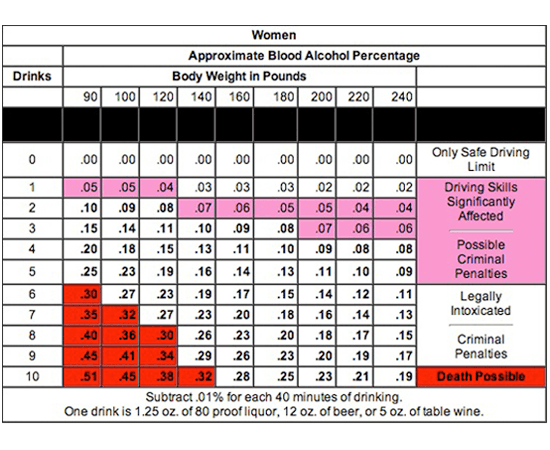 The lighter in weight you are, the higher your BAC will become as you drink. 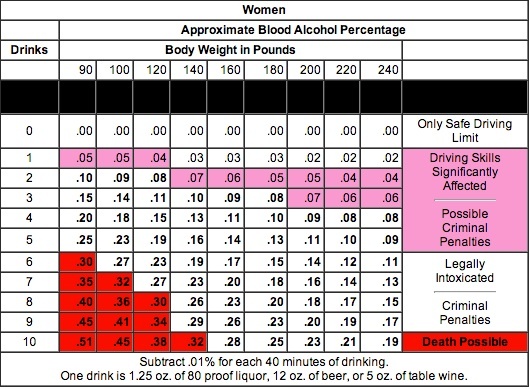 This makes sense as the total alcohol content is going to be less for larger people because there is more blood overall, which means more alcohol is needed to dilute it. Females, even with the same weight as a male, have higher BACs when the same amount of alcohol is consumed. 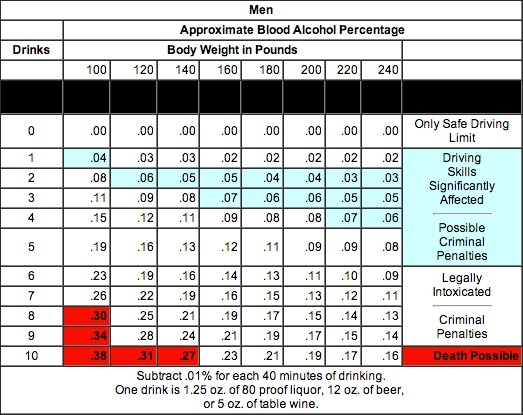 This should warn women that they should be more careful when attempting to keep up with males when drinking, because though everything else may be equal, their BAC is still going to be higher, which in turns results in them being more inebriated. Physical condition plays a large role, especially that of hydration. Water is to our bodies is essentially what oil is to machines. It keeps things running smoothly, and if their is a lack of water in your system, it will not be able to expel toxins and poisons as it should be able to. Such as alcohol, from the moment you ingest it, your body immediately tries to get it out of you, or pass it through. In order to do this the body needs water, and without its help, the alcohol has a more difficult time being removed. Which is an additional common reason for hangovers. The food consumed is important as it absorbs the alcohol when consumed, which gives your body a bit more time in having to process it. In essence, it helps to dilute the alcohol overall just as water does. But food can only go so far, you can’t trust what you ate 5 hours ago to tide you over. Medication and drugs that are consumed with alcohol can have some very nasty affects, and it is highly advised to never mix the two together. It’s well known that consuming certain combinations like this causes you to become severely inebriated. Fatigue can play a part in how intoxicated a person may feel after drinking. The body needs rest to perform all the functions required of it properly, and without it certain, things can slow down. Such as metabolism, concentration, heart rate, and reaction time. None of these side affects go well with drinking as the alcohol does the same. So the feelings can be doubled if you drink while fatigued. Perhaps the most crucial part to how drunk a person will feel while drinking is the actual alcohol content of the drinks that are being consumed. Obviously the higher the alcohol content, the drunker a person will become. Different types of alcohol have different affects to be aware of as well. Such as the difference between Absinthe and Red Wine. 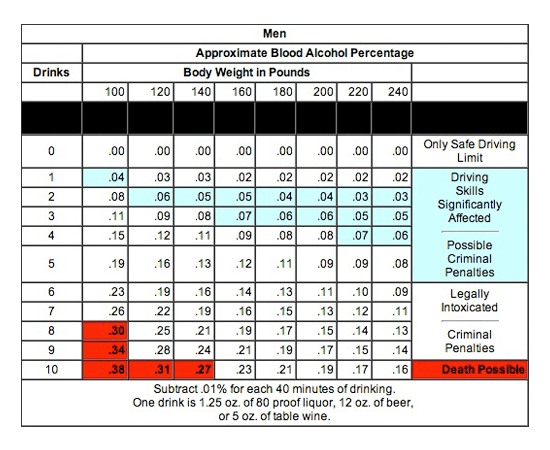 The charts that have been provided should be used as an overall guide to determine what your BAC may be dependent upon gender and weight. But it is more important to focus for a moment, and try to take note of how inebriated you feel. This should be your true compass, and if you’re seeing double while at the same time saying you’re good to drive, then your compass is extremely off. 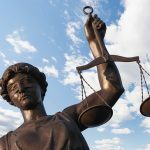 If you or a loved one has been involved in a DUI in Boulder, Colorado, it would be a wise to move to contact a Boulder DUI Attorney to defend your case. The Clark Law Firm has the specific knowledge and experience needed to help resolve your issue.